Larry. Bob. Archibald. These VeggieTales stars are the most famous vegetables you'll ever eat. Oops, meet. Their antics are known around the world. But so much of the VeggieTales story hasn't been told. 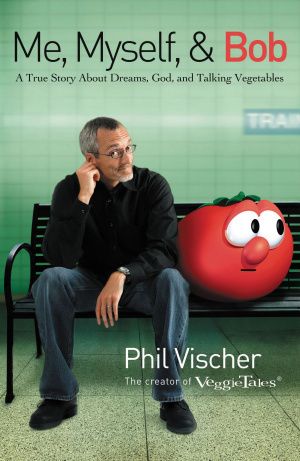 In 'Me, Myself, and Bob', Phil Vischer, founder of Big Idea and creator of VeggieTales, gives a behind-the-scenes look at his not-so-funny journey with the loveable veggies. From famed creator to bankrupt dreamer, Vischer shares his story of trial and ultimate triumph as God inspired him with one big idea after another. Me Myself And Bob by Phil Vischer was published by Thomas Nelson in February 2008 and is our 17589th best seller. The ISBN for Me Myself And Bob is 9781595551221. Be the first to review Me Myself And Bob! Got a question? No problem! Just click here to ask us about Me Myself And Bob.